While 0-100 km/h timings can tell you a lot of the acceleration of a vehicle, drag races can put things bluntly and give a result then and there. There has been a lot of debate between the bike and cars and the discussion will never end. However, when it comes to acceleration, the bikes still remain on the top and there are many reasons behind it. Here is another video that augments the same thoughts! 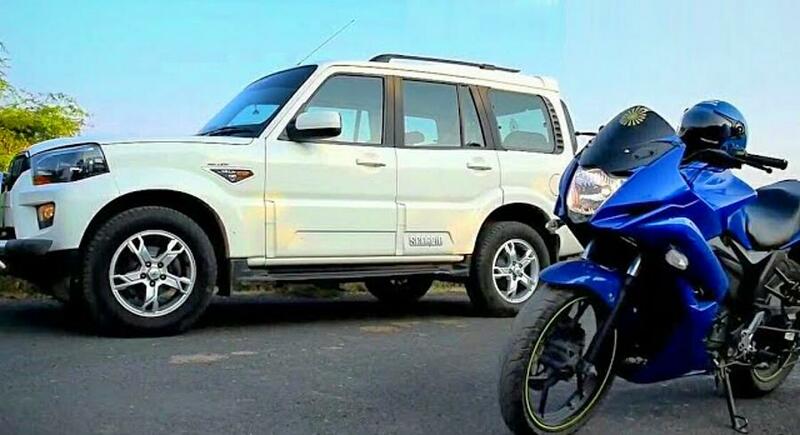 The video uploaded by Yashrajsinh Gohil shows drag race between a Mahindra Scorpio and a humble Suzuki Gixxer SF. The video was taken on an empty street. It shows both the vehicles lining up on the start and then gun for it. The vehicle seen in the video is a Scorpio S10 version, which gets powered by a 120 Bhp engine, which lower than the 140 Bhp power output for the most powerful version of the SUV. Both the vehicles look like in stock form. Both the vehicles open the throttle and go for the finishing line. There’s no camera mounted in the middle of the drag race, which is why we don’t get to know how the exact difference between the bike and the car at the starting of the race. However, the camera at the finishing line shows the Gixxer SF ahead of the Scorpio by a few seconds! We are also not sure about the length of the drag race and maximum speed achieved by the vehicles as there is no camera showing the speedometer. However, on a longer race, the Scorpio would have gone much ahead of the bike. In short races, due to the higher acceleration, the bike will always win. It all comes down to the power-to-weight ratio. The Mahindra Scorpio S10 weighing around 2,500 kg gets powered by a 2.2-litre mHawk diesel engine that generates a maximum power of 120 Bhp and peak torque of 320 Nm. The figure on paper looks massive but when we calculate bhp per tonne of the vehicle, which also gives us the value of the power-to-weight ratio, the figure comes out to be around 47.81 Bhp/tonne whereas the Suzuki Gixxer SF weighs a mere 139 kg and produces only 14.6 Bhp of maximum power. However, the power-to-ratio figure is massive 107.91 Bhp/tonne that helps the bike to propel at a much quicker speed initially. However, due to the lack of power, the bike does not reach a high top speed figure, which is why the high-powered Scorpio can overtake the bike on longer stretches. This holds for many performance cars and superbikes too. Performance car and bike manufacturers try to reduce the weight to ensure quick acceleration but even lightest vehicles are much heavier than the motorcycles, which is why motorcycles have the advantage when it comes to acceleration.